﻿ Opening Ceremony of the CiviliAnT – Civil Platform of Antalya Project was held in Antalya. MEDIA / Activities / Opening Ceremony of the CiviliAnT – Civil Platform of Antalya Project was held in Antalya. 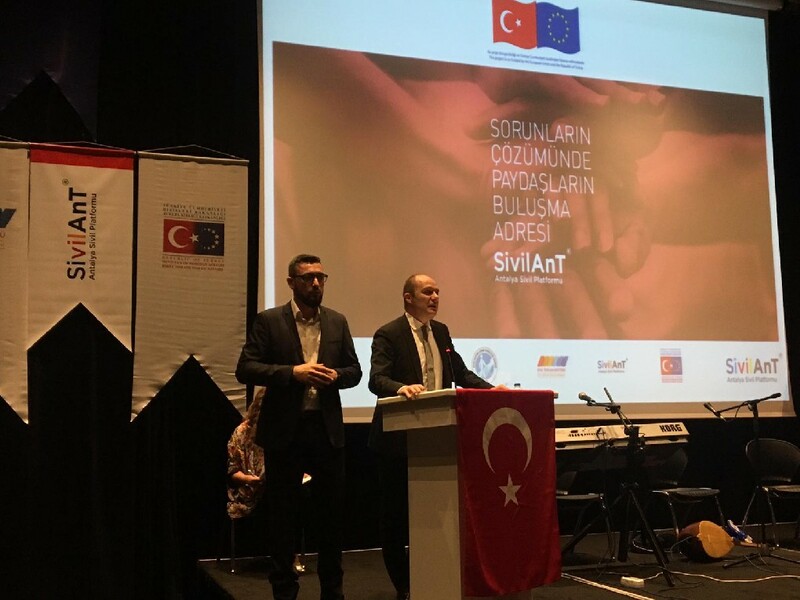 Opening Ceremony of the CiviliAnT – Civil Platform of Antalya Project, implemented by the Antalya Beyaz Baston Association under the civil society sub-sector of Instrument for Pre-Accession (IPA) lead by Ministry of Foreign Affairs Directorate for EU, was held on 8 th April 2019 in Antalya with the participation of Acting Director General of Financial Cooperation and Project Implementation Bülent Özcan. Participants from large number of civil society organizations, public institutions and universities were informed about the project in the opening event. During his speech, Mr. Özcan underlined the importance of the project in the sense that a city network bringing together civil society organizations, public institutions and universities in Antalya will be established. CiviliAnT – Civil Platform of Antalya Project, that will last 2 years with a budget of 394.562,50 Euro, aims at contributing to the promotion of active citizenship and participatory democracy by improving the capacities of CSOs, strengthening the cooperation among CSOs, public and private institutions, as well as by increasing the volunteers and philanthropists, through the established CiviliANT services.